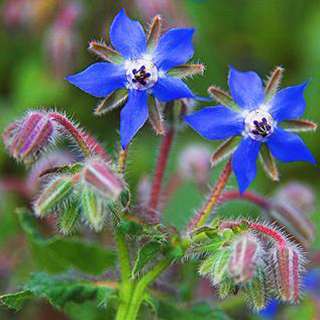 A native of Mediterranean regions and western Asia, borage has long been noted for its uplifting effects, and was called "the plant that cheers" (euphrosynum) by the Romans. This effect is in part due to its stimulant action on the adrenal glands to produce the "fight or flight" hormone, adrenaline. The seed oil is also produced commercially. Use 40 drops–1 tsp (2–5ml) 3 times daily for 2–3 weeks only, to help combat the effects of stress, or following steroidal treatment. Add an equal amount of water to the fresh juice and use to bathe itching skin or nervous rashes. Drink 1 cup (2 tsp herb per cup of boiling water) 3 times daily, combined with peppermint and elderflower for feverish colds. The seed oil is widely available in capsules, which can be taken to help treat eczema, rheumatoid arthritis, menstrual irregularities, or irritable bowel syndrome. Make the above infusion using either flowers or whole aerial parts and sweeten with honey or sugar (1lb/450g to every 1 pint/600ml of infusion) for coughs. Prefers any type of well-drained soil, in dappled shade or sun. Plant the seeds in late summer, then thin to about 12in (30cm) apart when the seedlings are established. It self-seeds enthusiastically. Gather aerial parts in summer.